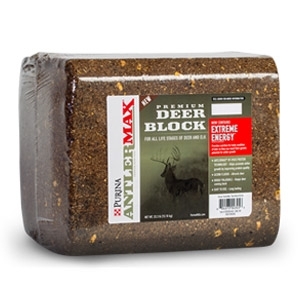 This highly-palatable, easy-to-use 33.3-pound premium block supplement for attracting and maintaining deer contains Purina’s proprietary AntlerMax® By-Pass Protein Technology, AntlerMax® Mineral Technology, Water Shield® Technology and the new Purina® AntlerMax® Extreme Energy™ supplement. New and improved AntlerMax® Deer Block provides more balanced nutrition for deer than whole grains. Click here for guaranteed analysis and more information.